This book is a real winner for readers who are interested in reading about children who live dramatically different lives to their own. Shahara lives in Azad Kashmir, in the shadow of the Line of Control. Her mother, father and older brother have all been killed, her Grandfather is dead, and she lives with her younger brother, all alone in the forest outside of a village. Shahana is only15 years old, but she works hard to keep her small family together. Then along comes a strange boy who needs their help, but helping him puts her and her brother’s lives in danger. 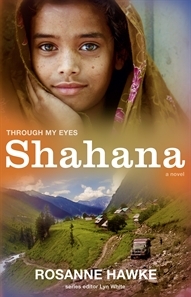 Fans of Parvana by Deborah Ellis will really enjoy this book, as Shahana is another strong female character. While it may sound like a depressing story, and there are depressing moments, it is at it heart, a story of hope, because we see how the rest of the world is beginning to become aware of what is going on in this war torn part of the world. There is information in the back of the book, giving historical background to the story as well as a timeline. The war over Kashmir is the longest running conflict in the world today, and probably the least well known. This is the first book in a new series called Through My Eyes, each book will be written by a different author, and each story will be about a child living in a conflict zone. 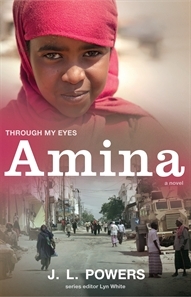 Amina by JL Powers will be set in Somalia and is out in September 2013.